The Biker Dress Dog Harness by Doggles is dangerously fashionable and functional. Embroidered rose tattoo and lace details. Skull & crossbones charm on durable D-ring. Heavy duty stitching and metal hardware. 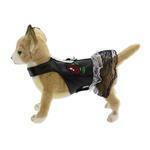 For the girly dog with a bad side, this Biker Dress Dog Harness is ideal! She can look feminine with the ruffled lace detail, but add a little sass with the "tattoo" and skull and crossbones charm. The soft faux leather makes her feel bad to the bone while keeping her comfortable. This pet harness biker dress is easy to care for with its wipe-clean "leather." The skull and crossbones charm adds some "heavy metal" detail to enhance the rose tattoo embroidery. This dog biker harness is the perfect choice for heading up to Sturgis or hanging out at the local bike shop. Great for photo shoots and events. Look for our Doggles dog goggles and biker hat for a complete look. Fun for Halloween too! Biker Dress Dog Harness by Doggles Customer Photos - Send us your photo! Rev 'em up, boys! Mitzy's ready to ride! Love, love, love this biker chick outfit! And obviously, so does Mitzy! Normally i don't like the color black but this harness dress is so super adorable. A must have thanks BaxterBoo. Paltrow looked ready for a trip to Sturgis in her biker dress and hat and doggles...from BaxterBoo of course...She really stood out for her walk! This is Ava. She is a Mi-Ki and weighs 2.3 pounds. This is the outfit she wears when she is on our Vespa!! Polly opening her Christmas presents. She likes her new Biker harness from Baxter Boo. This picture is in loving memory of Kensey Shade! We lost her last year June 29, 2012 due to enlarged heart and heart problems! She was modeling the Biker Dress Dog Harness! This harness now belongs to Lexi! Kensey was a beautiful little girl and sweetest dog ever! She was a Toxirn like Lexi! (Chihuahua & Cairn Terrier) We love and miss her more than anything!! She was a little superstar!!!!!! We all love you, Kensey Dog!!!!! Lexi modeling the Biker Dress Dog Harness! This is a great harness and fits Lexi extremely well. She looks very cute in it! Took her outside and she got some attention from the neighbors thinking she was pretty cute!! Lexi is modeling the Biker Dress Dog Harness! This was passed down to Lexi from her sister Kensey that we lost last year! It finally fits Lexi well! Kensey would have wanted Lexi to have it!! We miss miss and love you more than anything Kensey!!! Zoey is dressed" bad to the Bone" But can't fine her bike. Being just 5 months old she is little too young to ride herself Needs a ride to show off her Biker Dress. Mia loves to ride with us. This is her riding outfit. Dazzy just attended the Wisconsin 2012 Harley Davidson Owners Group Rally and was a HIT in her striking Biker Dress by Doggles. Piper is 3 Months old Chihuahua in the Photo you see. She loves prancing in her dress. "I own this biker dress, I do!" Best Friends and Best Dressed! Alice finally found her biker outfit and doggles for her riding debut. Thank you Baxter Boo. Her brother, Kirby, also is ready to rumble with his doggles n crossbones hoodie. Bitchin Posey in her biker harness. She is rocking it out. Punkin went from the Columbia County Humane Society to being a biker babe. Lucy at Biketoberfest in Daytona Beach with her Biker dress and Doggles. I'm a bitchin pug!!! Yeah, don't mess with me. LOL. Posted On 09/01/18 by Stella Mae from Santa Rosa Beach, FL Yes, Stella Mae recommends this product! Well made and looks great on. Posted On 10/16/17 by Lisa from Los Angeles, CA Yes, Lisa recommends this product! Tallulah wears her Biker Dog Harness a lot. It is quick and east to dress her, and the design is soft and comfortable. She always gets positive comments from her friends and gets stopped by strangers - This vest is definitely a crowd pleaser. Posted On 10/05/17 by Susan C A from , MT Yes, Susan C A recommends this product! Very cute but runs way large! Posted On 08/08/17 by Carrie S from Loganville, GA Yes, Carrie S recommends this product! This is adorable! I love that it's a harness. It's well made and fits well. Cannot wait to show everyone how "bad" she is in this sassy outfit! Posted On 06/10/17 by Sandra D from Cape Girardeau, MO Yes, Sandra D recommends this product! My little dog looks amazing in this. Everyone stops me and says how cute she is. Posted On 05/17/17 by Lauren H from Allentown, PA Yes, Lauren H recommends this product! Roxy looks so cute in her biker dress. I, on purpose, ordered the small for my 10.5 lbs. She looks so adorable in her dress. Love the Biker dress but the sizing is way off. I purchased a small, but it was way too big. I wonder if the dress sent to me was sized wrong. Would recommend if the sizing was correct. Have to return it. Posted On 04/09/17 by Lauren H from Allentown, PA Yes, Lauren H recommends this product! Roxy is now 10.5 lbs i have the small - big on her but still very cute. Posted On 03/11/17 by Lauren H from Allentown, PA Yes, Lauren H recommends this product! i have a small for my 11 lbs. so fun i love it thanks Baxterboo :) I love shopping here. Posted On 02/07/17 by Lauren H from Allentown, PA Yes, Lauren H recommends this product! I have the small for my 11 lbs dog, very cute but it is just big on her. still a great buy thanks BaxterBoo. Posted On 01/08/17 by Jeanette V from Aurora, CO Yes, Jeanette V recommends this product! I absolutely love this little dress, but it is too big, and I hope she will grow into it, or I can find a way to make it smaller. It is very good quality for the price. Posted On 01/03/17 by Lauren H from Allentown, PA Yes, Lauren H recommends this product! Posted On 12/10/16 by Susan & Bella M from Cranston, RI Yes, Susan & Bella M recommends this product! If you want people to IGNORE your doggie, the Biker Dress Dog Harness is not for you. But, if you want your sweet and sassy fashionista doggie to TAKE COMMAND OF EVERY ROOM INTO WHICH SHE TROTS, then this is the harness for you! Bella, our cairn terrier/chihuahua mix, wore this harness only twice, but it was an instant hit with everyone! The mixture of feminine ruffles and an embroidered rose with the soft black faux leather and skull and crossbones charm result in a high fashion, ironic and charming piece people cannot help noticing! Thanks, Baxter Boo, for this great harness which is not only functional and attractive, but also the best conversation piece in Bella's closet! Posted On 12/04/16 by Lauren H from Allentown, PA Yes, Lauren H recommends this product! This harness dress was on a great sale plus i had a coupon and it was Free shipping, Thanks BaxterBoo for keeping my dog look stylish and very cute. Posted On 11/20/16 by Andrea P from Auburn, MA Yes, Andrea P recommends this product! Posted On 11/13/16 by lauren hawkins from allentown, PA Yes, lauren hawkins recommends this product! A must have for your dog soooooo cute ! Posted On 11/12/16 by Susan & Bella M from Cranston, RI Yes, Susan & Bella M recommends this product! OH MY, WHAT CAN I SAY??? 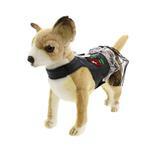 My cairn terrier chihuahua mix, Bella, and I were delighted with this clever Biker Dress Dog Harness! As is customary with Baxter Boo, the quality is superb, the fit is perfect because of the adjustibility, and the fabric and materials are top notch, including the secure velcro closings. But the real joy of this item is its clever and laugh-out-loud adorable design! This is not your usual harness ---- it is charming in its femininity with the peekaboo cut--out hem and yet bold in the use of the faux black leather and skull and crossbones! The embroidered red rose is the final elegant touch which makes this item a fantastic tongue-in-cheek, unique, attention-grabbing piece! Thank you Baxter Boo for a one of a kind fashionable item! Now, I will have to search for a motorcycle for Bella! Posted On 11/04/16 by Lauren H from allentown, PA Yes, Lauren H recommends this product! my dog is 11 lbs and i got the small. she is more ADORABLE !! another must buy for your dog, i also got this for Free that makes me very happy. Posted On 10/16/16 by Samantha H from , PA Yes, Samantha H recommends this product! It is very cute but not very well made. Would of been very unhappy if paid full price. Posted On 09/11/16 by julia c from Bella Coola, Yes, julia c recommends this product! Posted On 07/05/16 by sarah f from , Yes, sarah f recommends this product! Posted On 07/05/16 by Patricia B from Griffin, GA Yes, Patricia B recommends this product! Posted On 06/10/16 by Gwendolyn W from Bella Vista, AR Yes, Gwendolyn W recommends this product! I was looking for something different and cute. This harness fits the bill. Very well made and comfortable. My yorkie loves it and she looks so cute in it. Posted On 04/25/16 by Pamela K from Chester, VA Yes, Pamela K recommends this product! I absolutely love this however due to Rose' age of 6 mos. I was told to order a size up instead of Teacup, she walked right out of it. So disappointed but hoping she will grow into it. I did order 2 more Harness' in Teacup (different design) so hoping for better results! Posted On 03/05/16 by Barbara S from Rockport, TX Yes, Barbara S recommends this product! Adorable !!!! Very well made. Love the the lace, small rose and the little skull touches !!! Fits perfectly .. Waiting for her goggles to arrive and she's is ready to go for a scooter ride !!!! Posted On 03/04/16 by Jan K from Peoria, AZ Yes, Jan K recommends this product! I can't wait to see my puppy wear this dress. I tried it on her and the XS fits perfectly. She's 6lbs but The extra small does not leave much room for growth. Posted On 01/07/16 by Karen M from Lake Havasu City, AZ Yes, Karen M recommends this product! She love strutting her stuff when everyone tells her how adorable she is. Posted On 09/09/15 by Corrinna D from horseheads, NY Yes, Corrinna D recommends this product! Posted On 07/20/15 by Penny from Lakewood, CO Yes, Penny recommends this product! This is one of the cutest little outfits I have gotten for my Chihuahua. It seems to be pretty high quality also. What a cute design. Posted On 07/09/15 by Dawn C from Cape Coral, FL Yes, Dawn C recommends this product! Posted On 01/28/15 by Sandee L from Bullhead City, AZ Yes, Sandee L recommends this product! We have "BIKER WEEKEND" here once a year, and she will fit right in. It is so cute! Posted On 01/13/15 by Carolyn D from Houston, TX Yes, Carolyn D recommends this product! My Pugs are adorable in their harnesses....they really strut their stuff. They make friends everywhere we go, but the harnesses seem to draw in male admirers. Just too cute and THANKS to BaxterBoo for this opportunity! Posted On 12/21/14 by J from Lehigh Acres, FL Yes, J recommends this product! Love it!!! Easy on and off!!! Great conversation piece and functional, too!!! Posted On 10/08/14 by Lisa C from Glen Cove, NY Yes, Lisa C recommends this product! I love this biker dress harness. Shipping was quick and it looks great on Coco! Posted On 11/15/13 by Sara P from Sparta, TN Yes, Sara P recommends this product! Yes! It is adorable on as the picture shows. When we wear our leathers, so does Annie. Strong ring in perfect spot for Harley pet carrier leash. Posted On 11/09/13 by Geraldine Z from Rockford, IL Yes, Geraldine Z recommends this product! If you have dogs who love attention, this will get it. I have 2 Shih Tzu Divas who are always dressed and these are great with the attached ring there is no need for another harness. They fit great and people just can't help but comment on how wonderful they look. Especially Bikers.I also add that the embroidered Rose is their tattoo. Posted On 11/08/13 by Sara P from Sparta, TN Yes, Sara P recommends this product! This harness exceeded my expectations. Great quality and absolutely adorable. Very fast transaction. Items packaged well for shipping. Will be back again.